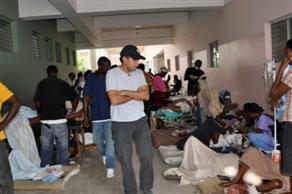 Dr. Sanjay Gupta has returned to Haiti on assignment. In this piece, he reports on a quake survivor who may have been trapped in debris for four weeks. Returning to Haiti. Tipping the scales of faith. I thought about that conversation a lot on the middle-of-the-night flight to Florida, a connection to Santo Domingo at 3 a.m. and then finally the early morning arrival in Port-au-Prince. She has seen the images on television of the unfathomable suffering over the last month, and she was affected by it in more ways than I realized. Over the few days I was home, we hardly talked about what I had seen in Haiti. I felt the need to protect her from those stories, some of which I may never share with anyone - and she was cognizant of the desire to not re open the emotional images. She also knew that while I was physically home, my mind never left Haiti. Most of the time I was in Haiti, I was a doctor. With the cameras off, I saw patient after patient, most of them with head injuries and with no access to a neurosurgeon. Many of them needed reassurance, and a few needed emergent operations. As a reporter, I was able to help highlight the stark difference between most international aid, and medical aid. In short, the requirement for medical aid was immediate –measured literally in minutes and hours. If action wasn’t taken, and quickly, people would die that could’ve been saved. As a father, I held a lot of small hands and offered a soothing voice, to children whose parents had been lost. So many times over the past month, I had my faith completely trashed as I saw unjustified loss of life and suffering. I saw amputations being performed without adequate anesthesia as nurses and doctors held down a patient while performing brutal operations. I saw the tears running down those same nurses and doctors cheeks while their faces were steeled with desperation, determination and a little anger at the awful position they were all in together. But, I also had moments where my faith was restored. Small improvements in water distribution, a slow trickle of supplies turning into a river of good will, a rush of health care providers and private citizens with sleeves rolled up and grit on their skin. Like my wife, they all wanted to help, in any way possible. If you look throughout the history of our own lives, there are a few occasions when we see something that galvanizes the entire world. In a world where there is too much bickering about politics, and too much fascination with pop culture, every now and then people simply come together. I returned to Haiti because I wanted to show the slow but inevitable medical recovery happening here. People should not forget what has happened and what will be necessary for a long time to come. I returned because I wanted to remind people of the relentless and extraordinary resolve of the beautiful Haitian people. I came back because the story I am telling is of the scales of faith being tipped here, just a little bit.